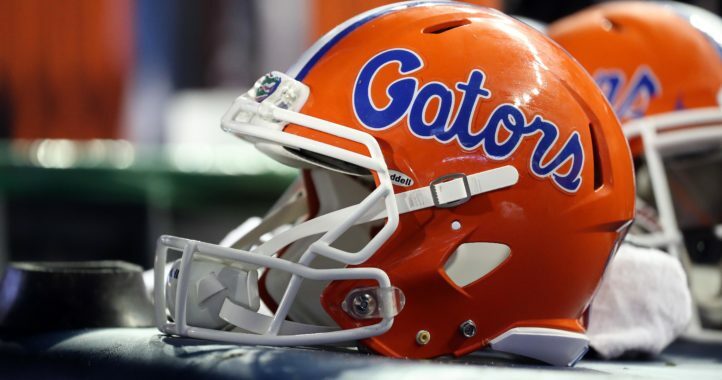 Florida closed the book on 2019 spring football Saturday with the annual Orange and Blue game in a sun-splashed Swamp. A good crowd was treated to a high-scoring and pass-happy affair, with the Orange crushing the Blue 60-35. Of course, who wins a spring game doesn’t matter. Spring games are mostly just for players and fans. For players, spring games are a chance to make one last impression on the coaching staff before the summer grind begins. For fans, spring games are bittersweet. They are a precious chance to make a spring pilgrimage to autumn’s cathedrals to tailgate with family and friends. They also give fans a glimpse of program growth and player development, a chance to take inventory of what progress has been made in the spring and what’s left to be done come the fall. On the other hand, a spring game on a beautiful Saturday down south is a reminder that college football season always feels far too short. So what could we glean from the game this Saturday, and from Dan Mullen’s second spring in Gainesville generally? Here’s three things I noticed on a glorious Saturday in The Swamp. Florida has assembled some of the best blue-chip talent in the country at wide receiver and the group has started to flourish under the mindful eye of one of the nation’s top position coaches in Billy Gonzales. Until Saturday, that WR corps might have been one of the SEC’s best secrets. It won’t be one for long. From the game’s opening snap, Florida’s receivers were all over the field. Kadarius Toney, the first Florida player since Percy Harvin to average a first down a touch (minimum 40 touches) in a season, starred on Florida’s first possession. First, he dropped a 40-yard dime of a pass to Feleipe Franks on a double reverse pass to open the game. Toney then capped the drive on the receiving end of a beautiful Franks throw to open the scoring. Grimes finished the first half alone with a staggering 195 yards on 4 catches. Freddie Swain, sometimes a forgotten man in what is becoming an elite national unit, also was constantly open. He added 103 yards receiving and 2 touchdowns in the first half alone to pace the Blue team. The receivers weren’t done with those three guys, either. Tyrie Cleveland caught a touchdown in each half and Florida’s best receiver, Van Jefferson, added a first-half touchdown. As for Florida’s tight ends, a pair of highly-recruited sophomores, Kyle Pitts and Kemore Gamble, flashed their wares with big plays down the field and in the red zone. Both are walking mismatches thanks to their unique blends of size and speed. Yes, it’s just a spring game and Florida’s defensive schemes were as vanilla as can be, with very little blitzing or disguised coverages. But this was still an outpouring of passing offense against a secondary group that as usual, figures to be among the nation’s best. Gators fans should be excited about that. The redshirt junior looked confident and poised Saturday, completing 13-of-18 passes for 327 yards and 4 touchdowns. He did throw a staged interception to retired NFL All-Pro and former Gator All-American Lito Sheppard, but most fans will forgive him, having seen Lito do his thing a time or two on Saturdays and Sundays over the years. Franks was impressive all spring, and fans got to see his offseason improvements first-hand Saturday. Franks showed the touch on intermediate routes that eluded him much of last season and, vitally, showed pinpoint accuracy on downfield routes, an area where, despite his huge arm, Franks has struggled throughout his career. It was the kind of performance that hinted Franks might be ready to follow in the footsteps of a host of Mullen quarterbacks who have made significant leaps forward in their second season under Mullen’s tutelage. 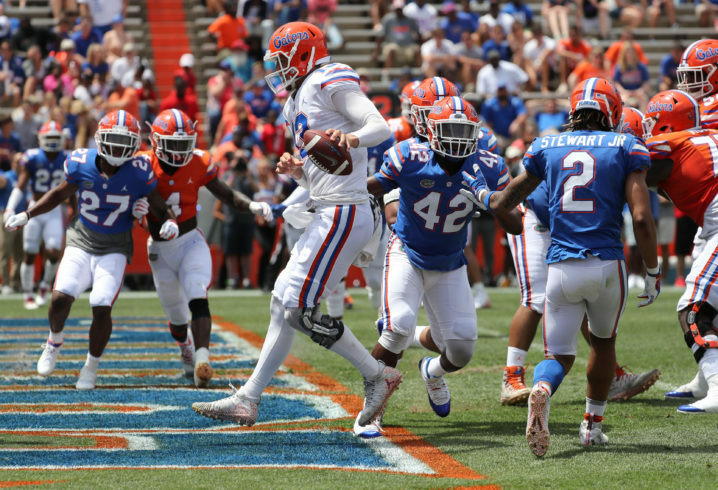 Florida’s stable of running backs, including All-American candidate Lamical Perine, were hardly used Saturday, as it was clear the staff had designed a game plan to ease the pressure on their young front. Yes, some of the available linemen were limited by injuries, including projected starters Jean Delance and Brett Heggie. But the line struggled to get much of a push in the run game against four down linemen most the day, and the backup unit was too easily stressed in even simple pass protections, which left backup quarterback Emory Jones running for his life early and often. I’d imagine it’s difficult to worry too much about a unit when 95 points are scored in a spring game. But the warts were evident upon closer look, especially considering the Gators faced minimal blitzes and hardly any disguised or exotic packages from Todd Grantham’s defense. 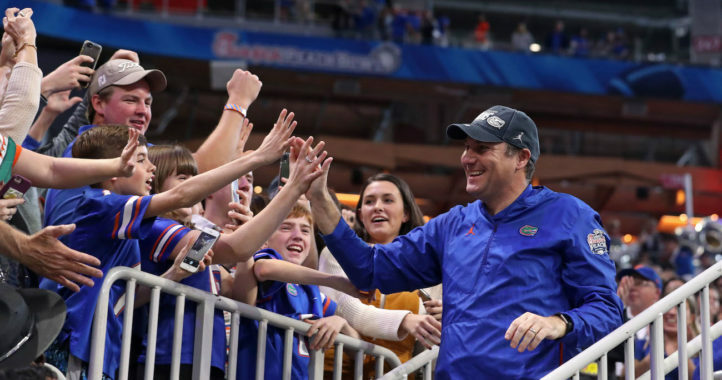 At the skill positions, Florida has the pieces to win a SEC Championship for the first time since the program nearly played for the national championship in 2012. Whether the Gators fulfill their promise will depend on how the offensive line gels and matures, beginning with Nick Savage’s grueling offseason strength and conditioning program. The Florida D should be concerned that they gave up 300 yards to Feleipe Franks. I think my Gam-gam’s crocheting club could limit his success. @GATORDONTPLAYNOSH…REAL NAME SOULD BE GATORDONTPLAYNODEFENSE!!!! School name? Does it matter????? That STACKED DB core needed a RETIRED X GREAT Leo Sheppard to play and intentionally throw him the ball, IN ORDER TO GET A DEFENSIVE PLAY!!! Yea, they sure look STACKED!!!! Maybe it was just that Dan Mullen and TODD GRANTHAM DEVELOPMENT PROGRAM making them look soooooooooooooooo great!!!!!! I mean if I went by the NAMES and what people say about them. Then YEA, THAT DB GROUP IS SPOOKY!!! But if I were to go by WHAT THEY LOOK LIKE IN THE GAME??? Then that STACKED DB ROOM is as spooky as THE DUMBO MOVIE and MUCH SLOWER!!!!! No actually, okay, DUMBO WAS SPOOKY compared to this group!!!! And if you think I’m AFRAID OF THAT FLORIDA OFFENSE based on the defense. How those WR were open by 10 yards minimum on every play. YOU WOULD BE MISTAKEN!!!! What made me more sick was those FLORIDA ANNOUNCERS working OVERTIME to convince everyone watching. That the DEFENSE was a little SOFT because poor Grantham couldn’t BLITZ!!! HE WASN’T ALLOWED TO BLITZ, POOR poor GRANTHAM!!!! But then a few minutes later. You hear… TODD GRANTHAM DIALS UP A BLITZ TIRED OF THAT VANILLA DEFENSE!!!! Y’all want to know what really scares me as A GEORGIA FAN? It’s those throws to X WRs that are retired when the defense is not allowed to cover them!!! Then those 2 point plays really scare me!!!!! I mean if they start allowing that in the real game vs florida. WE DONT HAVE A CHANCE IN HEL? That truly scares me!!!! It’s 53-35 right now. That of course is also proof that the defense is SPOOKY!!! 3rd and Grantham has went to another level!!!!!!!! They just SACKED/TACKLED the QB to, unless I missed something? Why did he have to get TACKLED??? He got his head ripped off while Franks and Trask and little Emory Jones got tagged WHEN THEY WERE TOUCHED AT ALL!!!!!! Listen people. WE ALL TALK TRASH!!!!! This is NOT trash talk. This last comment here I mean. But if THIS SPRING GAME is getting you GATOR FANS pumped up? Then I’m sorry but Y’ALL ARE DRINKING KOOL-AID!!!! I would be TERRIFIED AS A FAN if the UGA defense looked like that against an O LINE and bunch of average QBs like y’all have!!! Also if you believe that THIS GAME proves anything about the 2019 OFFENSE? Then again more KOOL-AID!!!! WHAT A COMPLETE JOKE ON BOTH SIDES IN FACT ALL SIDES OF THE GAME!!!!!! I do think you have good WRs if Dan Mullen don’t destroy them!!!!! But sorry, your still NO BETTER THAN UGA IN THAT DEPARTMENT either and might not be as good!!!!! We will see!!!! But I do believe you have WR talent. But then SO DO WE!!!! But lots of teams have ELITE WRs and DUMPSTER FIRE TEAMS!!!! Because the games are won and lost AT THE LINE OF SCRIMMAGE!!!! Line of scrimmage ON BOTH SIDES is not even close!!! Not based on what I just saw!!! ” MAYBE ” and I mean maybe your D line MIGHT be in the same league, possibly? You sure better hope so anyway!!! Because you are as far from UGA on the O line as the earth is from OTHER GALAXIES!!!!! Our QB is BETTER THAN FRANKS ANY DAY!!!! Our whole QB ROOM is better!!!! Our RUNNING BACKS are in another league to!!!!!!! Recruiting classes haven’t been in the same stratosphere and WONT BE IN 2020 EITHER!!!! Any recruits you beat us out for now will be decommitted from Florida after we WIPE THE FLOOR with you a 3rd year in a row!!!!! I really fear the Dan Mullen fan club will be losing steam in year 2!!!! But as long as he keeps playing DUCK DUCK GOOSE in important scrimmage games and throwing to retired NFL X PLAYERS TO PAD THE SCORE. And keeps bringing the same type GATOR teams to the Kentucky games and UGA games and Missouri games etc… ILL BE A LIFELONG FAN OF DAN IN THAT CASE!!!!!! DRINK THE KOOL-AID IF YOU WISH!!!!! GO DAWGS!!!!! UGA #1 in 2019 and OWNS THE EAST AGAIN AND PROBABLY THE SEC AND COLLEGE FOOTBALL!!!!! Aww, was this your first spring football game? I remember my first spring game and being confused, too. As long as there are no injuries, everyone wins in spring. I do agree that it’ll be interesting to see how much the OL limits the skill. And how the skill does when they’re covered (unlike the two plays shown). But I have to ask, what national championship did UF almost play for in 2012? Also, “Here *are* three things,” not is. … just can’t get enough! Florida was a USC touchdown against Notre Dame away from playing for the BCS National title game in 2012. The Irish made a stand and went themselves. I guess a 10 point TD by USC would’ve changed a 22-13 loss into a 22-23 win, but I don’t think 10 pt TD’s exist. Maybe they were a Purdue TD away, or a Michigan TD away, or a Stanford score away, or a BYU TD away, or a Pittsburgh score away? But I’ll admit that the memories of the epic Bama-UGA SECCG and Bama-ND BCSCG snoozer made me forget that UF was hanging around up there, backing into games based on the results of other teams. I see you still ignore your own mistakes though. I know authors think everyone reads their name, but I often don’t. Maybe I should to start saving my time. This is the same Florida team that only managed 9 points against UGA? The one Jarvis Jones beat almost single-handedly? The Gator squad that then proceeded to face-plant against barely-ranked Louisville in the Sugar Bowl? Oh, THAT Florida team – I remember them now. Mountain pup, I’d be more concerned with your team face planting in its last 2 outings, not so much in what a rival did 7 years ago. … I’d have to double check, but I’m pretty sure that was one of two years worth of football wins that ND had to vacate. If I’m correct, that would have taken them out of the rankings, which would have bumped UF to #2, and consequently, into the BCS championship game. Not that it would have mattered, they likely would still have lost that bowl game decisively anyway. Blitzer, we did. Flat out face-planted against the Longhorns, flushing the narrative that UGA was deserving of the playoffs – as I’ve repeatedly been reminded of recently by some Gator faithful. Just pointing out that maybe them that lives in glass houses should be careful where they toss their stones. Ben, UGA fans aren’t exactly known for thinking before speaking, they just let the stupidity flow freely. I’m happy that Franks has found success under Mullen. He really deserves it after the 2017 debacle. Grimes is going to be a problem. If UTs Oline figures it out, Jennings and Callaway are gonna be nightmares to cover.